Go ahead, kick off your shoes. With our innovative line of long-lasting foot odor products, your footwear will smell straight-from-the-box fresh for months on end. Crafted with a unique blend of powerful, odor-fighting ingredients, our foot odor control powders work quickly to eliminate unpleasant and unwanted scents. 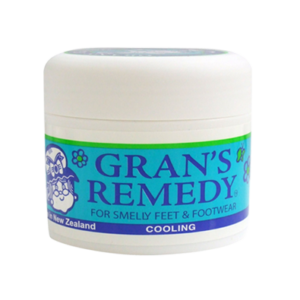 Unlike traditional foot odor products that simply mask the problem, these fast-acting powders harness natural ingredients to stop odors at the source. Soothing manuka oil eliminates and prevents bacteria growth in your shoes that leads to unpleasant odors, while kawakawa oil calms itchy, irritated skin. Simply sprinkle the powder in your shoes for instant relief and up to 6 months of freshness. Wherever your feet carry you, they deserve a little T.L.C. 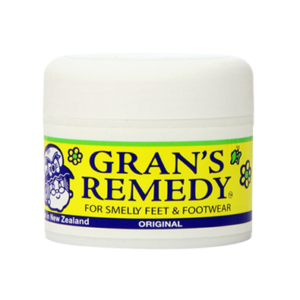 Discover the solution that fits your life with our 3 unique foot odor products, each designed to address a specific concern. Enjoy a calming sensation even after your most intense gym days, with our peppermint-infused cooling powder. Freshen up your everyday shoes with our scented variety, or try our time-tested original shoe deodorizer formula for an unscented, effective way to ban odors for good. 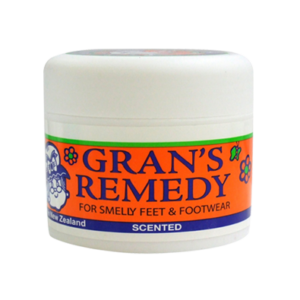 Gran’s Remedy foot odor products have been trusted for controlling unwanted smells for over 30 years. We create products that work fast and keep working so never have to slow down. With powder formulas that are tough on bacteria and gentle on your feet, you’ll never have to worry about kicking off your shoes again.